1. What is included in each Invisi-Fast Kit? 2. How strong can the fasteners be if they are only made out of plastic? 3. Do the fasteners require a lot of time to install? 4. Do you have to be a contractor to use Invisi-Fast or can you be a "do-it-yourselfer"? 5. Why do you recommend using construction adhesive? 6. What happens if I need to replace a board? 7. Can you install the Invisi-Fast from above instead of below the deck? 8. Do I need to purchase a Bo-Wrench to install my deck? 10. Can I use the Invisi-Fast on the deck stairs? 11. How many Invisi-Fast fasteners do I need for my deck? 12.. Do you offer any contractor programs or discounts? Answer: Everything needed to install your deck. Answer: The Under deck fasteners(Original and Angle Fasteners) have been professionally tested to withstand uplifts up to 1820 psf. The Biscuit fasteners have been professionally tested to withstand uplifts up to 2221 psf. 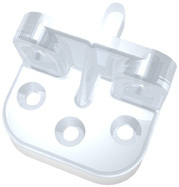 The Invisi-Fast fasteners are made out of a Polycarbonate resin. Polycarbonate is a tough, dimensionally stable, transparent thermoplastic that has many applications which demand high performance properties. This versatile thermoplastic maintains its properties over a wide range of temperatures, from -40"F to 280"F. It is the highest impact of any Thermoplastic, transparent up to 2" in special grades, outstanding dimensional and thermal stability, exceptional machinability, stain resistant and non-toxic. Polycarbonate is virtually unbreakable, making it extremely safe in areas where parts may be exposed to impact. When exposed to repeated heavy blow, the material tends to cold form rather than shatter. Answer: Compared to other hidden deck fasteners, the Invisi-fast is much less time consuming. People are also surprised at how simple they are to install. Just think about everytime you put a screw in your making progress. Answer: The Invisi-Fast was designed for the contractor or DIY'er. It was designed by a decking professional. Answer: Construction adhesive acts as an insulator, helping eliminate squeaking and creaking after your deck boards have settles, so your deck will sound solid years after installation. Depending on which exterior construction adhesive is required for your climate area, the adhesive also provides additional holding power. Answer: Invisi-fast allows you to replace any one board on your deck. You can replace a board in the middle of the deck by unscrewing the fasteners from below, replace the board, and screw it into place. It’s that simple. Answer: Yes. With the new tabs added to the fastener, it is much easier to install from above. Answer: No. The Invisi-fast does not require any additional tools to install. We offer the BoWrench as an accessory to assist in your installation. It is an accessory tool that pulls or pushes out any warps or twists that may be present in your decking. Answer: We guarantee to ship within 24 hours, but usually ship the same day. If you need your order by a specific date, please let us know. We try to accommodate all of our customers’ needs. We are located within the Eastern Time Zone, so earlier calling means that you will receive your product within your time frame. 12. Can I use the Invisi-Fast on the deck stairs? Why would I use a hidden deck fastener that I would not be able to use on the stairs? Answer: The Invisi-Fast is a perfect fastener for stair fastening. With our no spacer Invisi-Fast you can fasten all riser boards and the front and rear of all treads. Use a Invisi-Fast with spacer between treads if needed. Click on Stair Installation from our INSTALLATIONS page for a detailed stair installation guide. 13. How many Invisi-Fast fasteners do I need for my deck? Answer: We offer a handy calculator which requires the dimensions of your deck. For 16 on center decks, use our handy 16" Calculator to find the right amount of Invisi-Fast Hidden Deck Fasteners for your project by clicking here. 14. Do you offer any contractor programs or discounts? Answer: Yes. Please check our Contractor Program page for details, or call us for more information.